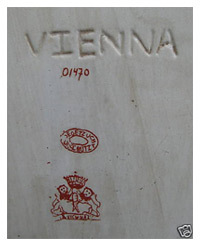 The Beehive Mark, as its commonly called, represents the traditional range of Vienna Porcelain Marks. However, the Vienna Porcelain Bindenschild (the shield not a beehive), incorporated in Vienna marks is a symbolic rendition of the center of the Coat-of-Arms of the Royal Habsburg family of Austria. The Bindenschild is how the Vienna mark should be referred to and it should always be properly aligned as a shield. 1718 to 1744 — is called the ‘Du Paquier period‘, or ‘Vienna before the mark‘. 1744 to 1749 — the Vienna Porcelain mark (Bindenschild) was applied in red or in blue underglaze or incised. 1749 to 1827 — the Bindenschild mark was applied in a blue underglaze. 1827 to 1850 — the blind-stamped shield mark was re-introduced. Between 1750 and 1780, the Vienna Porcelain pieces destined for the Austrian court were distinguised by a special (Bindenschild) shield mark in underglaze blue. Inferior quality pieces or seconds were marked with either a red or green ‘A’ over the underglaze blue mark or by two intersecting nicks over the mark. In the Sorgenthal period (1784-1805) an additional year mark was introduced. Even though many of the genuine Vienna porcelain marks will resemble a beehive, if turned upside down, there should be nothing else that indicates this is the correct way the shield mark is being presented. 2. If the base marks include, ‘Austria’ it is not from the Vienna Imperial and Royal Porcelain Manufactory. 3. If the base marks include, Germany or Czechoslovakia, it is not authentic. Vienna has never been in Czechoslovakia. 4. If base marks include, ‘Vienna’ or ‘Wein’ it is not from the Vienna Imperial and Royal Porcelain Manufactory. 5. If there is any importer’s mark or other company mark, it is not authentic Royal Vienna. In Rontgen’s book “Marks on German, Bohemian and Austrian Porcelain,” pages 575 and 576; Rontgen discusses Vienna Porcelain Marks and how to detect imitations of the true Vienna Porcelain mark. 1. Pieces with forged Vienna marks are usually heavily decorated with mythological or historical scenes, often with a description of the scene on the bottom. Quite a number of urns, vases and especially plates are signed “Angelica Kauffmann”. 2. Any Bindenschild in blue overglaze is a forgery. In the early years of the manufactory, circa 1744-1749, the shield was occasionally painted red, purple, black or gold overglaze, but never blue. 3. Any Bindenschild that is stamped in blue underglaze or overglaze and has perfect symmetry and shape is not a Vienna Porcelain mark. 4. 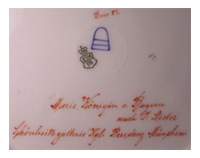 If inscriptions, signatures or letters are arranged in such a way that the mark appears as a beehive, then it is not a Vienna Porcelain mark of the Vienna manufactory. 5. Any impressed numbers, except 0-60 (molders and turners), 84-99 and 800-864 (year numbers from 1784-1864) are indications of a forgery. 6. Letters, words or shapes in gold overglaze are indications of forgeries. If part of the base is covered with a golden shape, this shape usually hides the original manufacturers mark. 7. 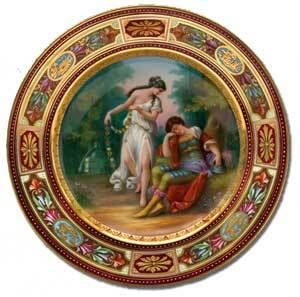 Any number over 155 painted in color overglaze, is not a decorators identification number for the Vienna manufactory. 8. Any number over 27 in blue underglaze is not a decorators number for the Vienna manufactory. 9. Any bottom description of a decoration or scene indicates that the piece was not decorated in the Vienna manufactory. 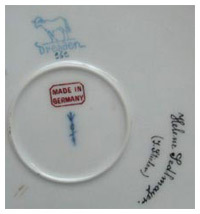 Example Vienna Porcelain Marks from actual items being offered by antique dealers and ebay sellers. Just because the mark is a blue underglaze shield or beehive or it’s an impressed mark doesn’t make it an authentic Vienna Porcelain mark. Don’t be fooled, examine the examples carefully and decide for yourself using the information and marks above. Which marks would you select as genuine Vienna Porcelain Marks? Royal Vienna Porcelain … All of the above examples were offered as genuine Royal Vienna Porcelain marked pieces on eBay and all the asking prices were for 1000’s of dollars. You decide if they are genuine and if you would pay the price.